If you're in the market for a full antivirus solution, BitDefender Internet Security might be what you're looking for. This security package is a complete suite of protection which offers protection against common threats online such as phishing, hacking, attacks and other online threats. The Internet Security suite comes with a modern and user-friendly interface which can make setup pretty easy. Its main sections include App Protection, File Protection and Web Protection, along with two different types of scans: Quick Scan and Vulnerability Scan. 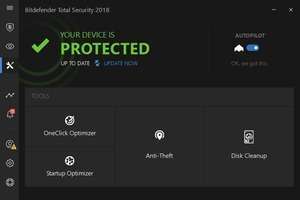 BitDefender Internet Security 23.0.22.97 is a shareware program and can be used as a demo to try the software until the free trial period has ended. A full version of the program is available after the trial period ends. For security reasons, you should also check out the BitDefender Internet Security download at LO4D.com which includes virus and malware tests. Additional screenshots of this application download may be available, too. 4 out of 5 based on 65 ratings.